I’ve written a few posts on how to implement dialog boxes in media center (Adding a version checker and Simpler popup dialog). They are both great examples of how to trigger a dialog box in mcml. Suppose though you want to do it all from within code, not within mcml. Why would you want to do that? Well, for one it means not having any AddIn calls in your mcml, and AddIn calls mean you can’t use the mcml preview tool – which significantly hampers development. For this example, I’m going to repeat the Adding a version checker example, but all in code. And obviously fill in the appropriate actions for each method. And that’s it – an mcml dialog operated entirely from your code. Microsoft?made use of Flash in Media Center for it’s integration with MSN Player. That was a startling announcement one month ago since it was assumed that Microsoft wanted to promote Silverlight over Flash, and would never allow Flash in Media Center. So, in the past month what has happened about that? ?Unfortunately?it seems to have moved backwards again. 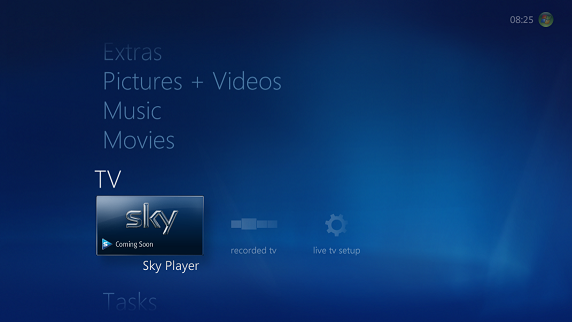 First of all, the UK integration with MSN Player has?disappeared, only to be replaced by the Sky subscription service. I think that is a major mistake by Microsoft, because I don’t think anyone will pay for a very cut down version of Sky on their PC, and it would have been better to have a working internet TV solution available. As far as I know, the Platform/APIs are only available for internal use. We don?t have any plan to release public documentation on that at this moment. So that means that until Microsoft change their minds or someone manages to?dissect?the?delivered?code to work out how to use the libraries in an unsupported way, we are stuck without Flash support for independent developer. 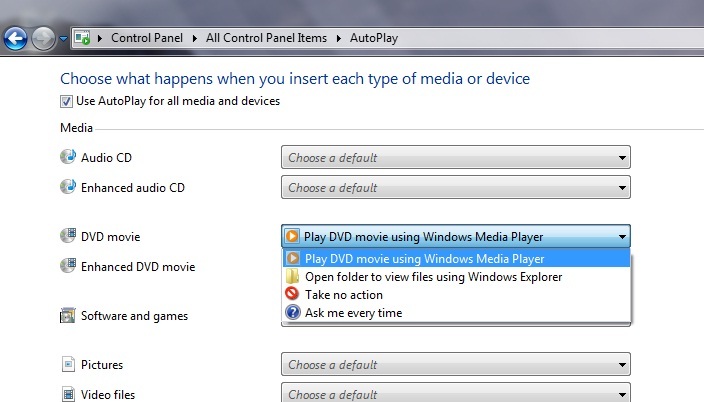 One of my great annoyances with Windows 7 is that you don’t have the option to auto-play DVDs with Media Center. I logged it as a bug during the testing phase, and was informed that it was intentional – something along the lines of if you wanted to use Media Center, it would be open already, so auto-play wasn’t appropriate. Some of you might have noticed that there hasn’t been much going on with TunerFree for a few months. I can now reveal why that was. For the past 2 months I have been working with Russian internet television provider, WebTelek, on a Media Center interface. WebTelek specialize in providing television and radio programs over the internet for the Russian market, both at home and abroad with the ex-pat market. Today they have Live TV from almost 70 channels, 20 days complete coverage of Catchup TV for over 50 of those channels, and thousands of movies, with growing content all of the time. 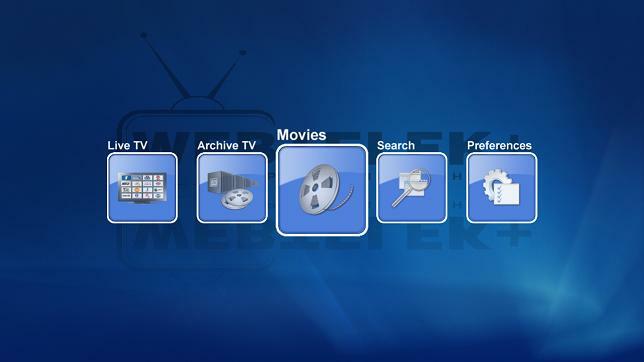 WebTelek approached me with the request to create a top of the range Media Center interface for their internet television service. They already had a web interface and a Media Portal interface, but wanted to expand in to Media Center. One of their biggest concerns was that it look great so that they could confidently have a superior interface to their competitors. That was a challenge that I was happy to take on, especially with the prospect of developing new library components that I could use in TunerFree. I won’t be publishing the full code for this project for obvious reasons, but wanted to share some of the key things I learnt from this project. I am currently working on a plugin feature for?TunerFreeMCE to allow other people to produce plugins for TV content from any source. The idea is that you specify some metadata about the channels (e.g. channel names, logos, details of how to get the program list), and the TunerFree code takes care of reading it and producing a list of programs. The buttons can only be ones from the list described in the documentation. A modal window requires either the user or a timeout to close it before any other actions can be done, whereas a modeless window allows the user to continue with other things in the meanwhile. The dialog is fired in this example by a property which is set in the code to true, and then set back to false when it is read. The condition only fires when the value is set to true in the first place by using the ConditionOp. One of the issues that has been hardest for me to learn with developing media center applications as been the linking of front end items in the MCML layer with data that I have in c# on the back end. For a long time I struggled with binding values from the code in to front end, and making method calls from the front end in to the back end. I suspect that the reason I did this was because that is how it is shown in the Media Center SDK and documentation, so I thought it was the only way. I did an interview with Ian Dixon over a month ago about TunerFreeMCE, which is in this week’s Media Center Show. The content is hopefully a great advert for TunerFreeMCE, but it is bit out of date now, in that it talks about needing mouse clicks in some places, which is no longer neccessary, and also talks about future plans for doing radio, which has now been done too. I also talk about how BBC doesn’t work on extenders, but of course now you can download the BBC programs you can watch them on extenders too. Also in there is my prediction that more TV companies will move to Flash, which was proved right on the 1st April when channel 4 moved over to Flash. I’m really pleased with the progress over the past month that has been made that has added so many more features, but the interview is still a great picture of the software. Have a listen on the digital lifestyle ?site or subscribe to the podcast.